PHNOM PENH—Cambodia’s ruling Cambodian People’s Party (CPP) said on Sunday that it had won a general election that rights groups said was neither free nor fair due to voter intimidation and the absence of any significant challenger to Prime Minister Hun Sen.
With no real opposition to speak of, Hun Sen was widely expected to win. 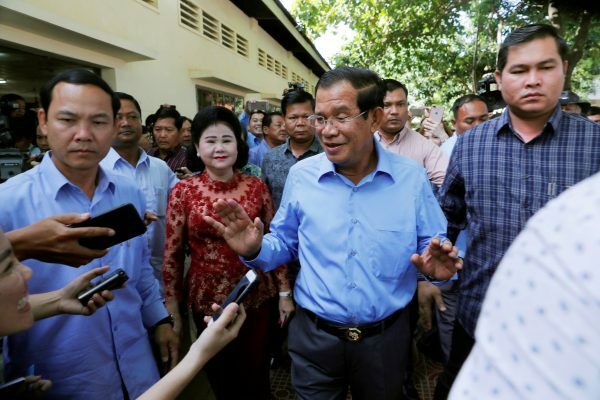 But the election was widely criticized as a sham because of a campaign of intimidation by Hun Sen and his allies against critics and the dissolution of the main opposition last year. CPP spokesman Sok Eysan said the party won an estimated 100 out of 125 parliamentary seats. “The CPP won 80 percent of all the votes and we estimate we will win not less than 100 seats,” Sok Eysan told Reuters in a telephone interview. Results from around the country were still being announced by the National Election Commission on Sunday and official results aren’t expected until mid-August. Hun Sen’s opponents had called for an election boycott. The National Election Commission (NEC) said in a statement that voter turnout was 82.71 percent. Earlier in the day it put the figure at 80.49 percent. “This is the success of the election,” Sik Bun Hok, chairman of the NEC, said in a televised news conference. 8.3 million people were registered to vote on Sunday. Yoeung Sotheara, an election analyst and legal expert who previously worked as a poll monitor in Cambodia, said Sunday’s result was best compared with the result of the nationwide local government elections in 2017, where turnout was 90 per cent, or 7.1 million voters. Electoral reforms in 2016 made it easier for people to register where they lived and cleaned out dead people and “ghost” names from the voter list, he said. Another polling station at a school was quiet, with a handful of voters casting their ballots in the mid-afternoon heat. Critics say the election is a backward step for democracy in Cambodia, marred by intimidation by the ruling Cambodian People’s Party (CPP) and the dissolution last year of the main opposition Cambodian National Rescue Party (CNRP) and the jailing of its leader, Kem Sokha, on treason charges. 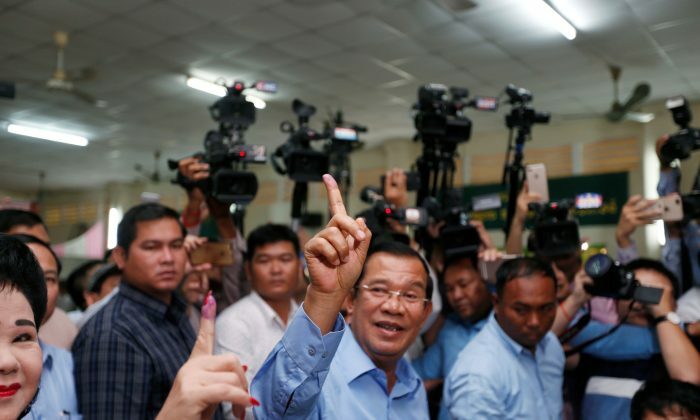 The number of spoiled votes will be closely watched amid reports of Cambodians being told to vote or face adverse repercussions from employers and local government officials. Some Cambodians told Reuters they planned to enter the voting booth, have their finger stained with ink but file an incomplete ballot paper as a protest. The United States, the European Union and Japan all said they would not be sending observers to the election. Cambodia said this week that observers from 52 countries would monitor the election. Many of the foreign observers spoken to by Reuters—some of which were from European populist and far-right parties—expressed support for the election. The 2018 election is the country’s sixth since 1993 when it emerged from decades of war, including the 1975-1979 rule of the Khmer Rouge, which is blamed for the deaths of 1.7 million people. Sam Rainsy, a self-exiled former opposition leader who lives in France, said in a statement that the election would hand a “hollow” victory to Hun Sen.
“A victory without contest is a hollow one,” he said. “For the first time in the 25 years since the elections organized by the United Nations in 1993, Cambodia lacks a legitimate government recognized by the international community,” he added. Hun Sen, a Khmer Rouge commander who defected, has ruled Cambodia for more than 30 years and is the world’s longest serving prime minister. Phil Robertson, deputy director of Human Rights Watch’s Asia Division, told Reuters in an e-mail that many voters grudgingly went to the polls out of fear. Authorities have warned that anyone boycotting the vote will be seen as a “traitor”. One voter at a polling station by the river at Preap Sisowath Quay in Phnom Penh said not voting was “too much trouble”. “I did not want to vote but I did vote,” said the man, who asked not to be identified. The NEC’s Sik Bun Hok said the high voter turnout on Sunday put to rest doubts about the election’s legitimacy. In a message on Facebook after polls closed Hun Sen thanked Cambodians for voting in “overwhelming numbers”. “You have truly chosen the path of democracy,” said Hun Sen.
Nineteen political parties ran against Hun Sen’s ruling CPP, but none are strongly critical of the government.